The Joker is back in these stories from BATMAN #35-40! For years, The Joker has regarded Batman with a sick, twisted love. But now, he's out to kill Batman! 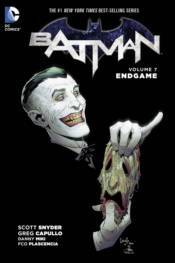 The Joker returns to Gotham City with a deadlier agenda than ever before, using every tool at his disposal to finally kill the Dark Knight. That includes turning Batman's allies against him in the bloodiest brawl that he's ever had to survive.